When I was in the eighth grade, we lived a block from a turkey farm. Hundreds of turkeys were gathered within a large enclosed field with all the things needed to raise turkeys. Because the field was adjacent to the road, it was easy to observe some of their peculiar behavior. Walking quietly by the field did not produce any interesting behavior. By contrast any sudden noise, loud talking, a dog barking, a whistle, a yell, or clapping your hands produced a consensus, a consensus of turkeys. The turkeys all gobbled at the top of their lungs. They all gobbled in unison. They gobbled as a chorus for a second or two in apparent agreement that gobbling was the thing to do. Then they returned to their usual placid strutting, waiting to see if some response from afar would come again. Clap your hands again and the same consensus, a flock of turkeys, gobbled in perfect unison. I was never able to determine whether the gobblers actually included all the turkeys, but my impression from the road was that non-gobblers may not have been paying attention at the time, but joined in later as required to join the consensus. The farmer was not very happy about folks disturbing his turkeys, making them anxious, stimulating them as a group into a frenzy, and interrupting their steady growth into plump and marketable gobblers. With empathy for the farmer, the boys in the neighborhood limited the number of times they would provoke the turkeys into consensus. The neighborhood dogs were quite another matter. From this I concluded that the notion of a consensus really does exist, at least among turkeys. From here it is easy to draw a parallel between a consensus of turkeys, all gobbling in unison, and the leaders of today’s turkeys who clap their hands and generate thunderous applause: a consensus if ever there was one. Al Gore, the mother of all global warming turkeys, claps his hands to keep the consensus in line and gobbling in perfect harmony. Gobble they do, like all good turkeys. As a social scientist, the most interesting reading is that scientists have achieved a consensus: the global warming consensus is real! There is no need for more discussion. The issue is settled, and as good scientists we should go to the next step in the process. Those who proclaim the consensus usually turn out to be non-scientists, like politicians, government bureaucrats, journalists, and those with an axe to grind or a million dollars to earn somewhere in the cap and trade scheme. Those with a thorough grounding in science have no need for a consensus. One may describe this same phenomenon as a cult, in which straying from the gospel is heresy. Dissent is not tolerated. Alternative opinions are expressed only by outsiders who should be converted to the ranks of believers, or be silenced. The cult believes, however, that the consequences are just as serious as Jonestown. This cult believes we are already drinking the Cool-aid. Their concern is to save us all by saving the planet we live on from certain destruction. The demons are at the gates, we are the demons, and unless we act quickly and radically change our ways it will be too late for us all. In science a consensus is called replication. When you repeat an experiment the outcome is predictable and invariable. Every time I clapped my hands, the turkeys gobbled. This might appear to be a consensus of turkeys, but wait! They also gobbled with loud talking, a car door closing, or a dog barking. There are probably dozens of things that cause turkeys to gobble in unison, and suddenly my scientific consensus becomes a mirage. Like good turkeys, they start enumerating all those hundreds of things which the turkeys believe are tied directly to global warming: hurricanes, raising sea levels, death of polar bears, kidney stones migrating north, and disappearing ice caps. In the name of climate change (read global warming) there is just enough science generated to confuse the turkeys. The turkeys (read non-scientists) are unable to distinguish a dog from a yell from a whistle or from clapping your hands. The turkeys simply accept what they are told: If it is caused by global warming, gobble. So they do. And when, exactly, will this calamity occur? The turkeys don’t really care because the wheels of global catastrophe are already in motion. The turkeys know! All they care about is gobbling, and what they need is the powerful voice of other turkeys who behave as they do, the true gobblers. Those who won’t gobble on queue are not true gobblers, and should be thrown out of the flock. Within a consensus, only believers are welcome in the ranks, and the believers will make it so uncomfortable for non-believers, the global warming deniers, that they will shut up and leave. What remains is a consensus of true believers, a cult. Turkey Science: Global Warming: The problem with global warming is the weakness of the scientific argument. This weak argument, that the planet is getting warmer, is multiplied many times over by using a constant in a so-called scientific formula. The formula predicts the future by taking a short term increase in temperature, a trend line, and repeats this increase endlessly until a catastrophe is predicted. Given this unexamined methodology, a catastrophe is always predicted. The only thing that remains is the time period needed for the catastrophe to occur. This is turkey science, and gives no weight to all relevant factors. Turkey scientists don’t care about all the relevant factors. They already know the primary culprit, mankind, and what he is doing to destroy the earth, burn fossil fuel. Fossil fuel is evil because it has an atmospheric carbon footprint, which the consensus claims they can control. Mankind and fossil fuel are the dynamic duo, evil incarnate! These evil doers should emulate Brazil, which clears the forests and in the clearing grows renewable gasoline. We should all be into renewable. Renewable everything! Green forever! Warming Science: One must consider the prediction of future warming in the context of earth’s known history of warming and cooling. 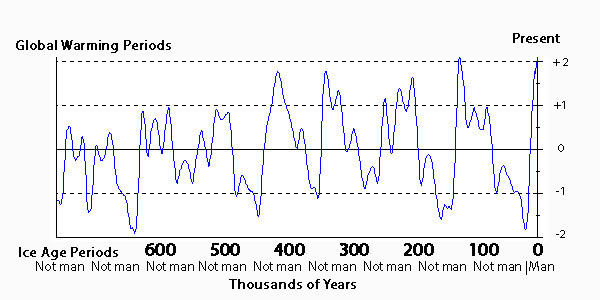 For two million years, the earth shows equal periods of warming and cooling. These periods are based upon actual measurements from ice cores, rather than upon trend lines, which have no ending point. While we are currently at the high point of the normal temperature range, it does not appear to be out of line with other high temperatures by history. Trend line analysis, when applied to any point on the chart produces both catastrophic warming and catastrophic cooling. Today’s warming alarmists believe that warming is seriously dangerous for the planet. A few thousand years ago, the earth was largely covered by ice, a circumstance that is probably not survivable by mankind. These scientific results are not predictions based on use of a constant from a trend line. Yet responsible scientists have only a few ideas about what causes these cycles to reverse, based upon what we know. The turkey scientists gloss over the above chart, which may be extended back into earth’s history for two million years. This is not a short term trend line covering only a few decades. The long term trend line is zero on the chart for the last two million years based on history. Note that man was not on the chart in large numbers until the last 10-20,000 years, an insignificant portion of the above period. Rock-solid inference from this data supports as clear lunacy that man had anything to do with global warming or cooling for the last two million years. Yet, based upon trend analysis, a flawed science, the turkeys insist that man is responsible for the seriousness of this last period of warming. Gobble, Gobble! As for man’s carbon footprint, it is well established that carbon is a fundamental element in our environment, and has been present in the atmosphere for over two million years, well before man appeared on the scene. Legitimate scientists are working diligently on the planet’s carbon cycle in which carbon is part of the physiology of all life forms. Carbon circles the globe in the atmosphere (parts per million), and is stored in carbon sinks across the land and seas. All plant, animal and human life are an integral part of this cycle. While a great deal is known about carbon, the idea that carbon in the atmosphere can be capped, controlled, or managed by the government is the most magnificent form of lunacy. This lunacy is compounded by those who wish to declare atmospheric carbon, this building block of every living thing, a pollutant by the government. Carbon could also be classified as the universal lubricant that holds our diverse environment together. The carbon solution is a slippery atmospheric concept because it is not visible to the naked eye. As such the amount of carbon in the atmosphere may vary up and down wildly and the man on the street, like a bunch of turkeys, will gobble when it moves in either direction. When they gobble, Al Gore will sell them carbon credits to calm their fears. With his proceeds from carbon credit sales, ghost-like associates are employed to plant trees in the forests to offset the invisible carbon demons. The most fascinating dilemma is how the turkeys will respond when the trend line of earth’s temperature supports a serious period of global cooling, a long-term potato famine, or an imminent ice age. They would then want to reverse their present cap and trade scheme. They would preach that we must emit a larger carbon footprint in order to avoid a planetary catastrophe. Burn more fossil fuel, avoid renewable energy, and get the atmospheric carbon as high as possible before we all freeze to death. Smart, really smart. Hopefully, Obama’s basic intelligence will overcome his Harvard legal education. Before our government mortgages us all into the poor house through a carbon tax, will Obama come to his senses, or will he fall in line with the United Nation’s turkeys to achieve international respect? Falling in line with the U.N. global warming alarmists is selling the country and all she stands for down the river. Part of the solution, you say, is to put more air in our tires? The wisdom of this is like an environmentalist spitting in the ocean to raise the sea level. Use your brain, Obama. Are you the president of America’s greatness, or do you just represent the turkeys? Use your Harvard education, Obama, and never underestimate the power of idiots in large numbers. Many of them are gathered in Washington, and are responsible to conduct the country’s business.